Quickly understand how butter is measured and weighed around the world. 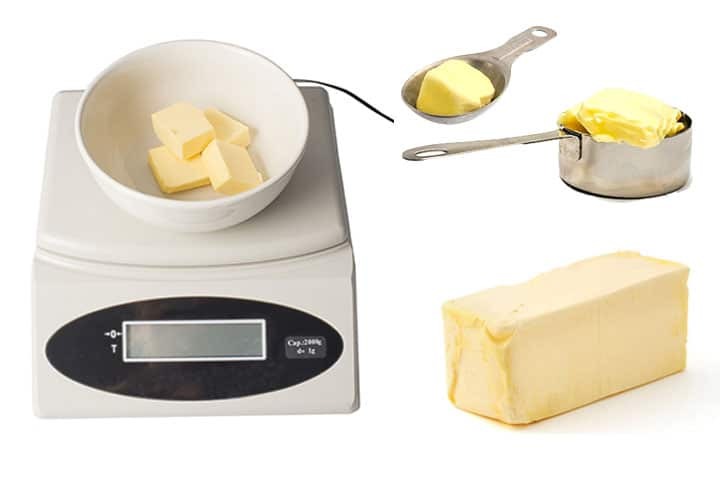 Convert butter from US cups, sticks of butter and tablespoons and more to grams with handy Butter Measurement Conversion Charts. The confusion: Most countries outside the US (and Canada), weigh their butter using scales which makes it very difficult to understand American recipes. American recipes vary so much on the measurements of butter referencing anything from a stick to a cup, teaspoon or tablespoon. I lose track all the time and end up Googling an answer when creating recipes. Even my recipes vary (having lived in both The US and Europe). I knew I couldn’t be the only one in need of quick answers. So, in the charts at the bottom of this page, I have tried to give a variety of different conversions to try to clear up some of the confusion. 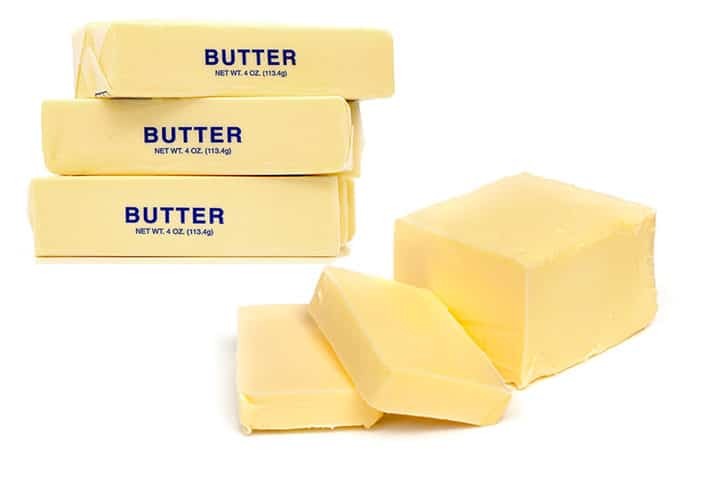 American butter is required to have at least an 80% fat content. French butter must contain a minimum of 82% fat. The higher the fat content in butter, the less water it contains, making pastries flakier. More butterfat also means a softer texture, faster melt, and often, a deeper yellow color. European butter is known for its rich taste which is a direct result of the higher butterfat content. It also contains less water, European butter is often the preference for baking, especially when the butter flavor is essential in a recipe. To make it easier to convert yourself – Try memorizing one fact in each category so you can work it out in your head. 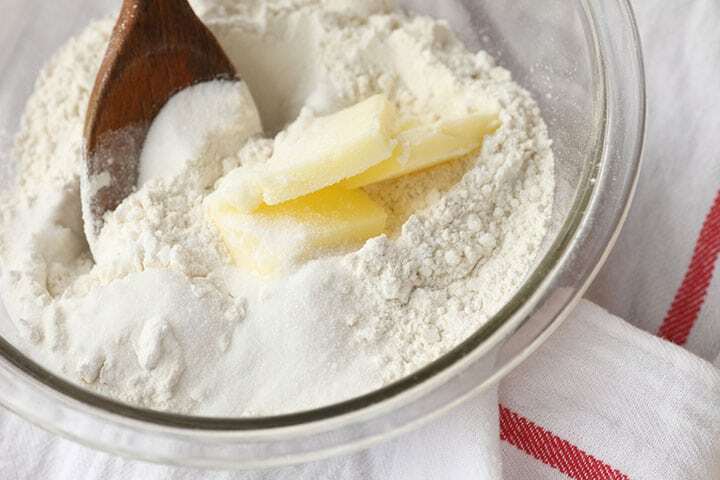 For example – 1/2 cup of butter equals 1 stick of butter so if a recipe calls for 2 sticks of butter, it will be simple to work out in your head that 2 sticks are equal to 1 cup and so on. 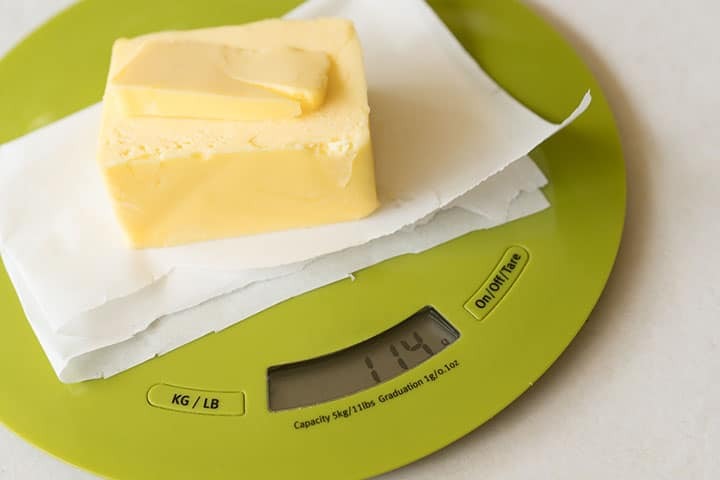 Try to get into the habit of weighing butter instead of adding it to measuring cups or using the guide on the package. It’s more accurate to use a scale. In America, butter is measured in many different ways: cups, tablespoons, ounces, and pounds, but many recipes also call for “sticks”. 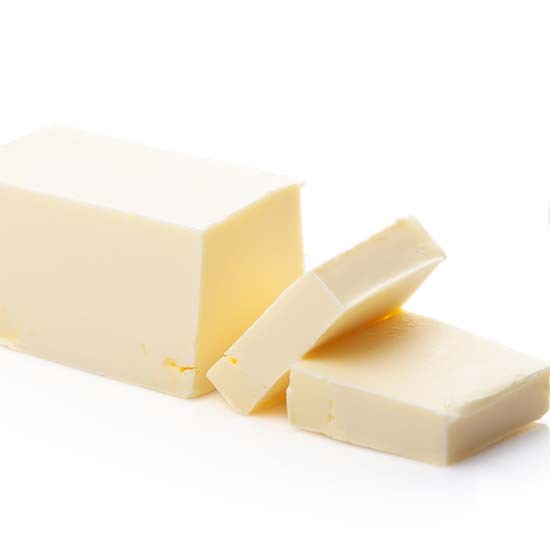 In the US, butter is mainly sold in 1/2 pound or pound packages, which is split into wrapped sticks weighing 1/4 pound (110g) each, which also equals 1/2 cup. The wrapping on each stick also has marks showing tablespoon measurements. There are eight tablespoons in a stick. When working with butter that’s been defrosted, don’t defrost it in a microwave. A microwave will destroy the emulsion. Instead, cut it into chunks and leave it out until it’s cold but workable. You can tell that butter is the right temperature if when wrapped, it leaves a bit of residue on the wrapping and if the cube bends easily without breaking or cracking. When a recipe calls for creaming butter, a good rule of thumb is to let your mixer whip the butter for three minutes. Mixing butter at high speeds increases the possibility that it will heat and lose its emulsion. During the creaming process, keep your mixer at a relatively low speed. Please feel free to leave a comment if you think any additions need to be made.